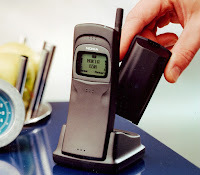 Back in 1996, most phones were quite brick-like but devices such as the Motorola StarTAC proved that these devices could also be carefully designed to be rather more fashionable. Nokia were probably the biggest adherent to clunky but usable design, so the Nokia 8110 (launched in September 1996) represented a significant change of direction. The Nokia 8110 was striking for several reasons, firstly it was curved (giving it the rather cruel nickname of "banana phone"), and secondly it was a slider with the keys hidden when they weren't in use. Sliding the guard open would reveal them, and the curved shape of the device placed the microphone directly in front of the user's mouth. To show the 8110 off, you could charge it (and a spare battery) in a desk mount. Physically it was a remarkable device, but the Nokia 8110 also found fame in the move The Matrix where a modified version appears in a crucial sequence. Although in reality the 8110 wasn't spring-loaded, the follow-on Nokia 7110 was. Despite the clever design, underneath this was a very simple device by modern standards with a monochrome dot-matrix screen plus SMS and an advanced SMS-based information system that nobody ever used. With an add-on data card you could send faxes and email at a blazing 9600 bits per second. Ultimately it was looks rather than ergonomics that made the 8110 a success, but despite several devices featuring the same lines over the years, ultimately customers seemed to prefer handsets that were flat. The Nokia 8110 (and revised 8110i) are highly collectible, with prices ranging from €25 or to up to €3000 for an unused one in mint condition. Median prices for good examples seem to be €120 to €500 or so.